While major paint damage is becoming rarer as coatings technology improves, all vehicles will have chipped paint at some point. What causes these chips, and what can you do to prevent them? The harder something strikes paint, the more likely it will chip off. However, if the paint is in good shape, it will be flexible, letting it absorb the impact. Age, wear and damage can harden paint and separate the paint layers from the body panel and each other, making it easier to chip. To prevent chips, you need to take care of your car’s paint and prevent debris impacts. – Keep your car covered, whether that means putting it in a garage, a carport or under a cover. – Keep plenty of distance between your vehicle and gravel trucks. Ideally, you should stay at least 200 feet (12 car lengths) away, but any distance you can put between your car and the truck will decrease the chance of an impact. – Slow down when you’re on gravel roads to keep your tires from kicking rocks into the sides of your vehicle. Some automakers install mud flaps or plastic chip guards, thick layers of clear plastic applied directly to paint, to protect areas most at risk of damage. When you’re having collision damage repaired, these parts need to be replaced to ensure your new paint job will last. There’s more damage than may be obvious after a collision. When metal panels are bent, it can break the anti-corrosion layer on the metal, opening it up to rust. Surface rust can spread underneath the corrosion protection, causing the panel to bubble and separate from the paint. At this point, it doesn’t take much to chip and peel paint. Abrasion from dirt and cleaning products wears down the paint, making it thinner. Keep your car clean, but don’t buff or clay bar your car unless the paint really needs it. Waxing your car will add a protective layer to preserve your paint. Ice and snow removal tools can dig into paint, causing it to chip. Stick to using tools built for vehicle snow removal, including snow brushes and scrapers made from plastic. Using the wrong soap can strip chemicals out of paint, leaving it less flexible. Dish soap may be used by professional detailers, but only when they’re trying to remove wax before sealing the paint. Car wash formulas are far less harsh but have no problem taking off salt and road grime. Around here, we usually see a temperature range of around 0-90°F through the year, while the average day to night temperature difference is 15-20 degrees each day. As the temperature changes, the car expands and contracts, pushing and pulling on the paint. There’s not much that can be done to prevent aging from this process, but it can be a lot worse if the car wasn’t painted correctly. If the clearcoat and color coat are mismatched, they’ll expand and contract at different rates. This stress can cause crazing. Eventually, the stress will break apart the color coat, creating thin lines that resemble a shattered mirror. Since the paint is pre-cracked, it chips very easily. “Crow’s feet” or “checking” is similar to crazing, but it’s spread randomly across the panel. 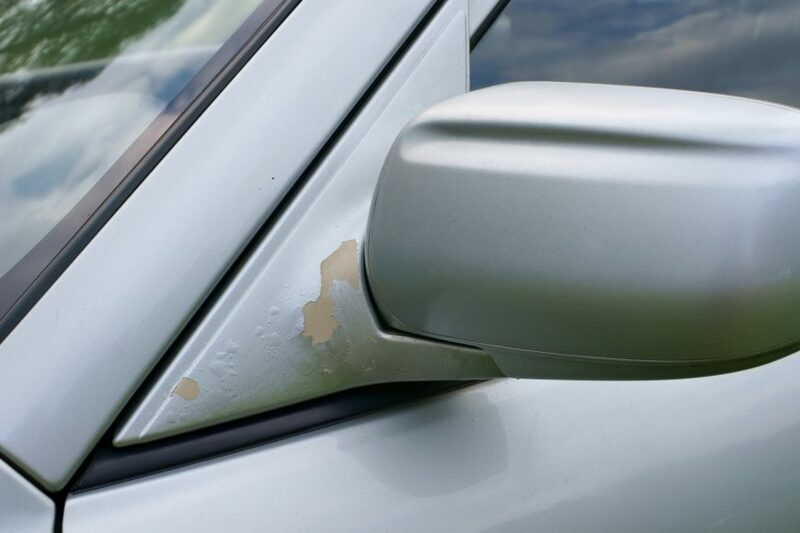 This was a common problem on older vehicles with lacquer paint, but it only occurs in modern paint when mistakes are made during the painting process, either when cleaning the panel, applying the paint or curing the finished paint job. If you need collision repair, bring your car to Merton Auto. We offer a lifetime guarantee for all of the work we do, so you can rest assured that your car’s new paint job will last. Our shop is located just south of Silver Spring Drive in Merton, just a few miles away from Lisbon, North Lake and Pewaukee.